Note: If you need a refresher about what all this advanced metric mumbo jumbo really means, see yesterday’s post to turn yourself into an all-knowing wizard of basketball statistics. Let’s take a look at yesterday’s 77-67 victory over Tennessee, shall we? On the motion chart below, you currently see GameScores on the x-axis, the eFG% on the y-axis, and the size of each player’s bubble is determined by his Usage% from last night’s game. Press the ‘play’ button or scroll to the right to observe metrics from last night’s win. With this motion chart you can see all four metrics charted against one another in whatever manner you’d like for every game Duke has played this season. You can also isolate each individual player to track his performance. The first thing that jumps out at you upon examination of the metrics from the Tennessee game is where the bubbles are positioned on the chart. Unlike a much more statistically efficient game against Davidson, Duke only registered three players with GameScores above 10 last night. 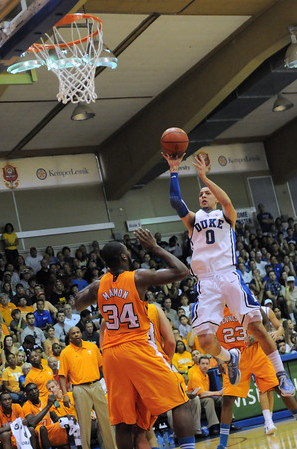 Only Austin Rivers, Seth Curry, and Ryan Kelly were able to break double digits. However, you will also notice that despite the low GameScores, six out of the nine Blue Devils that played last night had above a 40% eFG%. This indicates that despite the fact that Duke shot well (48.1% from the field and 38.9% from 3-point range), the Blue Devils were extremely inefficient thanks to sloppy offensive execution, 13 turnovers, and 18 team fouls. Upon examining individual performances from last night, some interesting trends arise. Austin Rivers sticks out like a sore thumb. Although he was able to turn around a rough start to finish with a team-high 18 points, Rivers only registered the third highest GameScore on the team with 10 (the definition of average in terms of GameScore). Meanwhile, his 39% Usage% was a team-high as well, besting his next closest competitor, Quinn Cook, by 14%. This means that while Austin was on the floor, he accounted for 39% of his team’s shots. Although a Usage % this high would not be uncommon for an elite player, Rivers has yet to play like one. 14.2 points per game along with 40.4% shooting from the floor and 68.0% free throw shooting are not perfect numbers, and don’t warrant 39% of the possession. Rivers has shown flashes of brilliance this season, especially in the second half of last night’s game, but needs to become more efficient in his play. If he wants to take his game to the next level, he’ll need to slow down his thought process and break out of his tunnel vision. Sometimes splitting double teams and taking on big men is not his best option. Duke will take his scoring production, but not at the cost of 6/15 shooting. For more on Rivers, check out Sebastian Pruiti’s most recent article for Grantland for some excellent analysis. After showing what he can do during the stretch run of ACC play last season, Seth Curry has been the Blue Devils’ greatest scoring threat, and is doing so in an efficient manner. His 12.9 GameScore was second on the team against Tennessee, and he was able to do so with a 55% eFG% and only a 22% Usage%. Over the team’s five games, Curry has registered a low GameScore of 10.2 with a high of 20.6 against Michigan State, all the while shooting with an eFG% above 54% in each contest. Meanwhile, his Usage% has been considerably lower than Rivers’, and has been less than 23% in four of Duke’s five contests. Though last night was not Curry’s best statistical performance of the season, the Blue Devils will take 17 points and four assists on 5/10 shooting from Seth any day. They’ll just consider his 1 of 4 shooting from beyond the arc an anomaly. Curry and Rivers have received much of the credit for Duke’s early season success, but arguably Duke’s most consistent player this season has been junior Ryan Kelly. In five games this year Kelly has posted GameScores between 9.4 and 15 each time, while registering above a 58% eFG% and below a 24% Usage% in four of his five games this year. Kelly has been a consistent scoring threat, and his promotion into the starting lineup in place of Miles Plumlee, whose play has been lackluster this season, was well deserved. Ryan’s 17 points and six rebounds on 5/9 shooting in just 27 minutes last night earned him a GameScore of 14 to go along with his 67% eFG%. This earned him the title of Duke’s most efficient player and second most efficient shooter in their victory over the Volunteers. All advanced metrics aside, this year’s Duke team appears to be a significantly more talented version of the 2007-08 Blue Devils, who fell in the second round of the NCAA tournament to West Virginia. Much like the current Duke team, the ‘07-08 team had only one senior and a crop of juniors to lead a relatively inexperienced squad. The team also struggled with an identity crisis throughout the year, failing to recognize who their star was and scoring by committee. 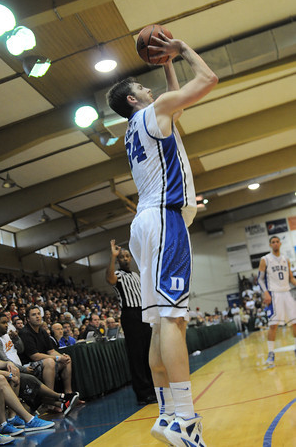 Both the ’07 team and today’s Blue Devils had five players averaging double figures in scoring, and it was unclear who would lead the team on a given night. However the main difference we see between these teams is that the 2007 team’s roster didn’t have players that could single-handedly take over games. DeMarcus Nelson, Greg Paulus, and Gerald Henderson along with Kyle Singler, Nolan Smith, and Jon Scheyer in their early years were never going to put the team on their back and carry them to victory. 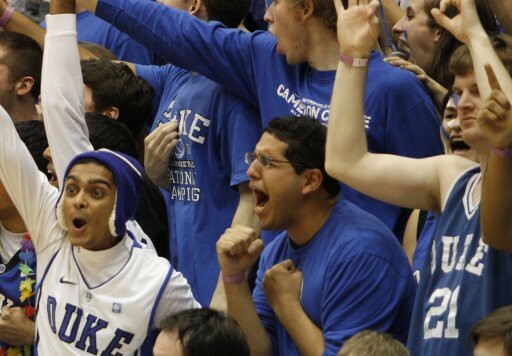 However, Curry, Rivers, and Andre Dawkins have proven this year that they can score in bunches and Ryan Kelly and Mason Plumlee have provided some much needed consistency inside that Duke teams have not had since Shelden Williams roamed the paint in Cameron. We hope this look behind the box score has been an enlightening one, and look forward to bringing you more data as the season presses onwards. Be on the lookout for our live blog of the Maui Invitational semifinals against 15th ranked Michigan later this evening along with game and statistical recaps tomorrow. Stay Crazie, my friends.